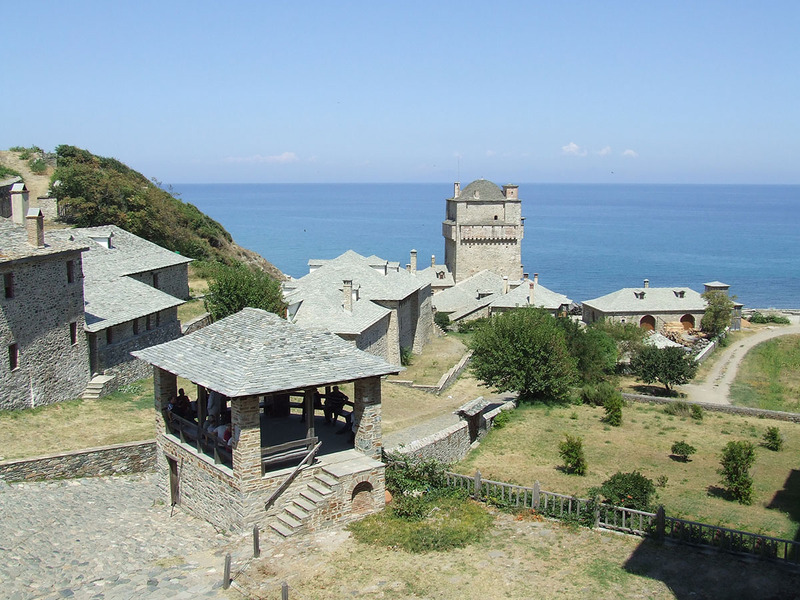 The Monastery of Iviron celebrates on the 15th of August the Dormition of Mary Virgin. 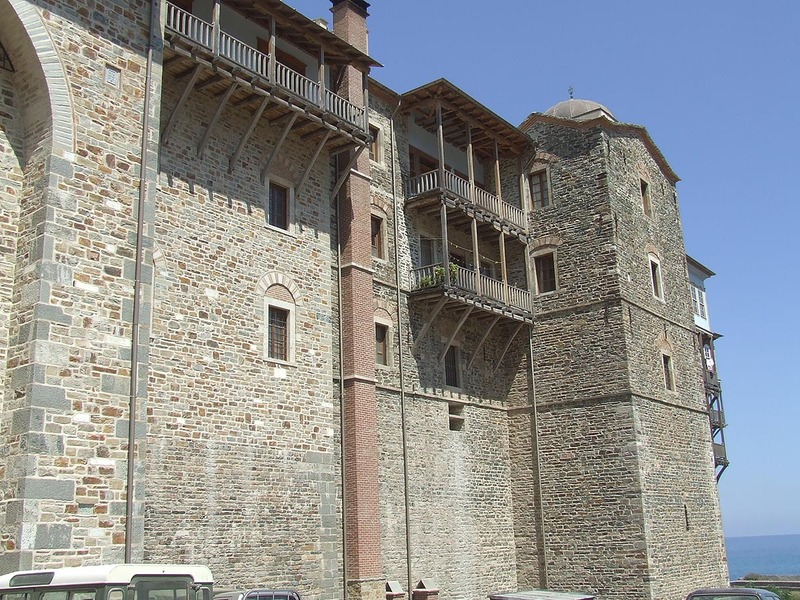 It was founded in 980 by Ioannis Tornikios of Iberia - a member of the court of the ruler of Iberia (Georgia) and general of Byzantium - in the position where previously was the Monastery of Clementos. The Monastery is located on the north side of Mount Athos near the estuary of a big torrent, over the ruins of the ancient city Cleonae and it is third in the hierarchy of the monasteries in Mount Athos. It is 1 hour and 30 minutes away from Karies on foot and 30 minutes by car. 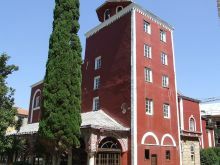 The Monastery of Iberon owns the Skiti of Timiou Prodromou, six Seats and twenty six cells from which sixteen are located at Κaries. 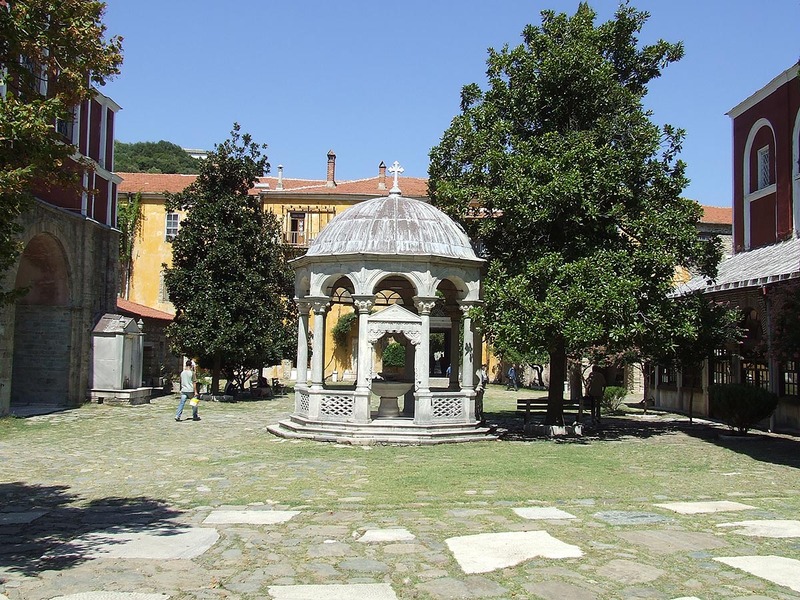 One of the owners that appears in 1030 as the abbot of the Monastery, for whom there is not much information, was the monk Ioannis Varasvatze. 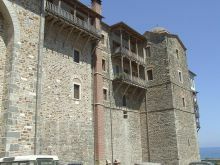 After a period of decline the Monastery received great help from Byzantine ruler, Serbian kings and from rulers from Georgia. In 1648 the Tsar Alexy II gave to the Monastery of Iberon the Monastery of Agios Nikolaos, one of the richest monasteries of Moscow, which remained in the possession of the monastery until 1932. 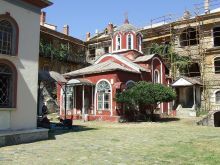 The material wealth of the Monastery helped to its refurbishing and to its full restoration after the fires in 1845 and 1865. The last monk of the Iberian community, which was continuously being diminishing, died in 1955. The Catholic Temple of the Monastery was built in 1030 and renovated in 1513. It is devoted to the Assumption of the Virgin Mary and it was decorated with murals between the 16 th and 19th century. Besides the murals dating back to 1592 but were repainted later, equally notable are also the silver Russian light of the 18 th century in the shape of a tree and the three precious chandeliers and iron railings. 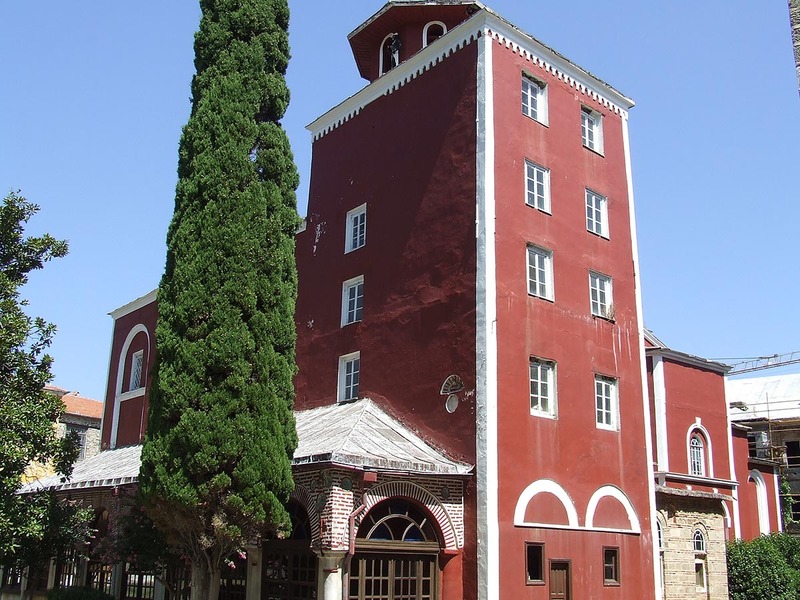 The Prothesis was built in 1848 in place of the previous one which was destroyed. The old one had murals of the 17 th century, whereas the new one is without murals. The Stoup was renovated in 1865 and there are murals with scenes relating to water on its dome. 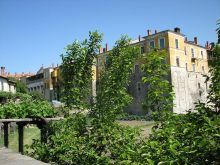 The Monastery also has 17 chapels from which the most important is that of "Portaitissa" with the most important holy picture of the Monastery, the Virgin Mary the Portaitissa* near the Gate of the Monastery of Iberon. In the courtyard of the monastery one can also find the chapel of Prodromos and on the right of Liti the chapel of Agios Nikolaos while on the left the chapel of Archaggeloi. Among the relics are detailed embroidered canonicals of the patriarch Dionysios IV and the cloak of Grigorios V. A separate artifact is the curtain for the Royal Doors, which represents the Dormition of the Virgin Mary. Among the most impressive heirloom is also a silver light in the shape of a lemon tree with three gold-plated lemons -an offer of pious Muscovites in 1818- many wonderful filigreed gold canonicals and a cloak called 'the bag of Tsimiskis' , which is embroidered with scenes representing ten lions and four Byzantine two headed eagles in an arabesque context. Probably a canonical of a senior cleric of the 15th century. There are still many documents sealed with valuable stamps but for the monks the most precious treasure is the sacred relics of honored martyrs and fathers of the church, preserved in silver and gold shrines. Apart from the right hand of the Vasilios the Great, Bishop of Cappadocia (329-379), the kara of Bishop Grigorios Nyssis, there is also the left leg of Makrina, the abbess of the Monastery of Irida. 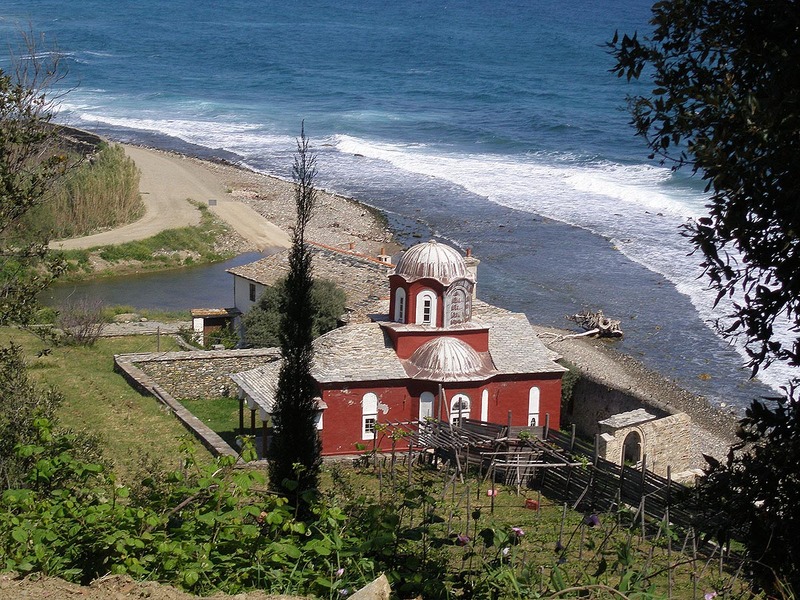 At the Monastery guests should visit the chapel of "Portaitissa", which safe keeps the miraculous holy picture of the Virgin Mary Portaitissa. The sacristy of the Monastery with its timeless and valuable treasures. 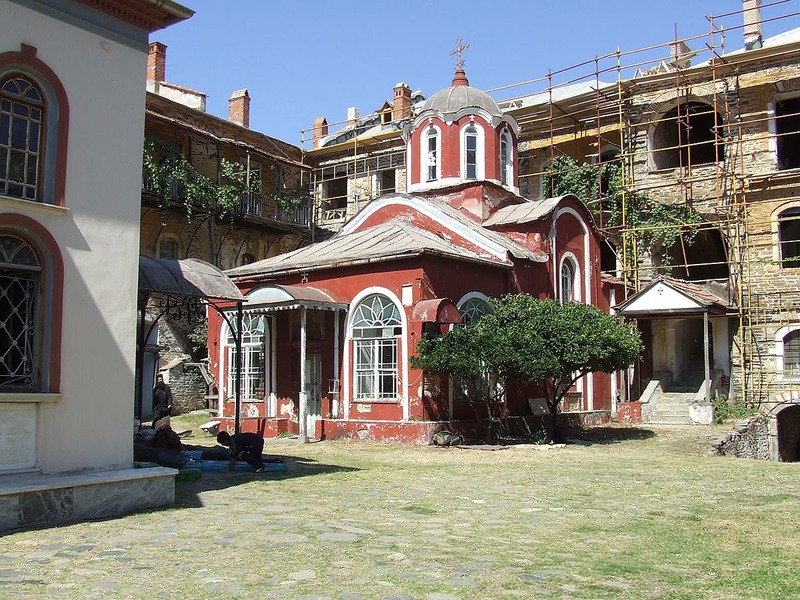 Between the Katholikon and the main entrance of the Monastery there is a chapel with the most important picture of the Monastery the Virgin Mary the Portaitissa. In the period of the iconoclasm in the 9th century the ruler was Emperor Theophilos who lived in Nice and was the holder of the image. He had to throw the picture in the sea to save it from disaster. The picture floated up the coast of Mount Athos where it was found by the Georgian hermit monk Gabriel. After the death of the monk, the abbot of the Monastery of Hiberon transfered the picture to the Monastery for security and placed it in the sanctuary of the temple. 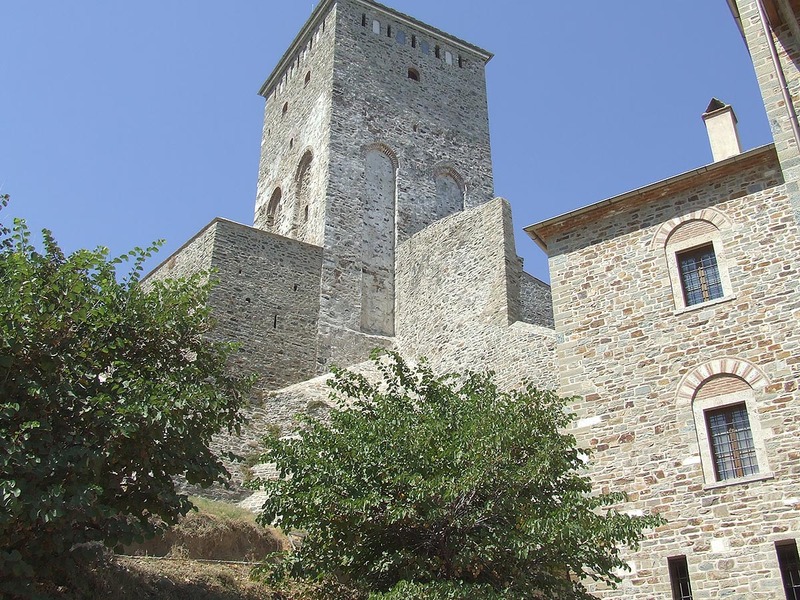 But the picture disappeared from there and reappeared over the central gate of the Monastery. Three times they moved it back and three times it disappeared only to reappear at the same place where it finally remained. One day a voice was heard from the sky addressing the monks: 'I didn't come to you to protect myself, but to protect you'. The monks then built a chapel near the gate commemorating the picture, which is placed inside a silver and gold cover with precious stones. Several offerings are placed all over it and since then it is celebrated in this position.